BlackBerry is suing Ryan Seacrest and his company, Typo Products LLC, for coming out with a slide-on keyboard for the iPhone which BlackBerry considers to be a copy of the “iconic” BlackBerry QWERTY keyboard. 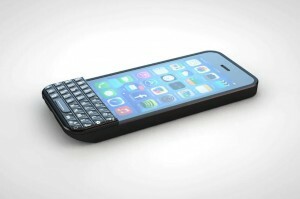 The keyboard is meant to slide onto the iPhone 5 and 5S, but BlackBerry feels that the design and style of the Type keyboard is too similar to the design of the keyboard found on the original BlackBerry smartphones. Typo Products’s flagship product was the Typo keyboard and although it has only been around for a short time, slapping Ryan Seacrest’s name onto it would have likely been enough to bring some success to the product. Of course, a slide-on keyboard is truly beneficial to some people who have a hard time typing on a completely virtual keyboard, and especially the kind found on the iPhone, which is much different than a physical QWERTY keyboard. The lawsuit was filed today and BlackBerry is looking to bring it in front a jury in order to receive compensation from Typo for the patent infringement. Seacrest and his partner, entrepreneur Laurence Hallier, were looking to make the Typo keyboard available for pre-order sometime this month but as soon as BlackBerry heard about those plans, it put a lawsuit in motion. Summary: BlackBerry has filed a lawsuit against Ryan Seacrest’s company, Typo Products LLC, for coming out with the Typo keyboard case for the iPhone which allegedly copies the design of the BlackBerry keyboard.